The dry leaves look, well, like dry leaves, except that we can say these 250 gram cakes look decent – not really any huang pian, not too tippy either, but a decent mix. This year Jing Jia Tang, like many others, decided to press more 250gram cakes than 357. They also decided to press them a little more tightly than typical stone pressed cakes as can be seen in the photos. The broth is a pleasing, pale yellow. Clear and clean. The steeped leaves look good enough: nice uniformity in colour, no apparent leaf damage, a little scorching maybe here or there, good whole leaves with a robust body to them that show no signs of mishandling or poor processing. 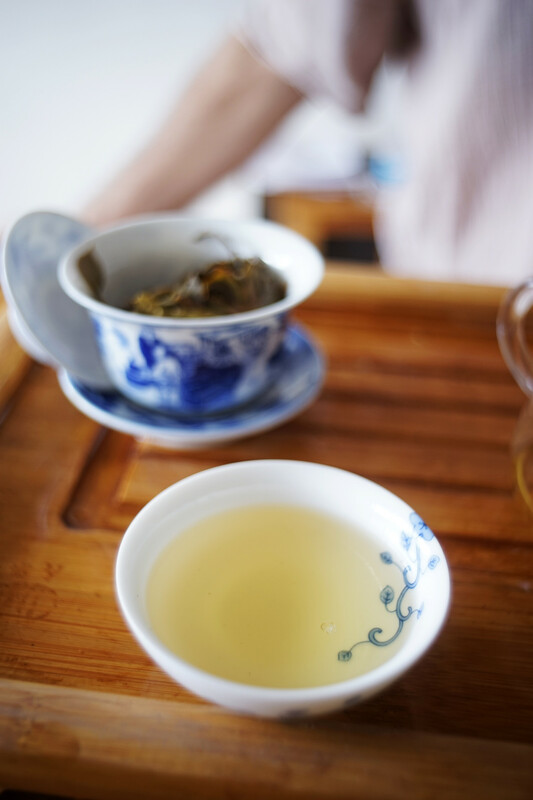 After a first shot of water, the gaiwan lid gives off the ‘to be expected’ honey and caramel aromas, but there’s also something a little more vegetal, tobacco-like. The ru kou is smooth and sweet, and the broth carries enough bitterness to balance the sweetness. The first impression is that the tea has enough thickness to give it some staying power. The fragrance is a little reserved – not very ‘yang‘. The broth feels pleasant in the throat and sinks unimpeded. The huigan, like the fragrance, does not show itself in a rush, but then, once it does, it lasts very well. The cha qi feels at this stage to be quiet, understated but has some low-key impetus. Generally a good Mengsong tea: Somewhat unassuming, yet with some weight, some bass-notes that suggest it might, in a few years turn out to be a rather bigger tea than it appears to be at this stage. Also, compared with last year’s tea, this year’s ‘Qing Sheng‘, which comes from the same tea gardens, is a little thicker and weightier. Background: This tea comes from the same tea gardens as the 2013 ‘Qing Sheng’ See here for more details of the tea garden.